Every time I get a new Android smartphone or tablet, I install certain apps right away, before I even really start to play with the device — apps I use every week, if not every day, on the Android gadgets I test as well as the ones I own. For your benefit, I've narrowed down the list to 10 free Android apps I can't live without. 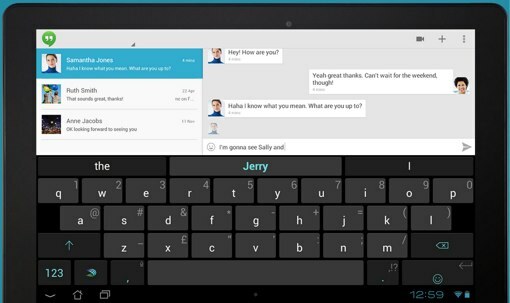 Because most stock keyboards aren’t that great, SwiftKey is often the first app I download on a new phone or tablet. SwiftKey's prediction engine, which offers suggestions for words as you type as well as the next word you need, is based on the words you use most. It learns from your everyday input as well as from your email, social media accounts, blog RSS feeds and other sources (if you connect them). If you have more than one Android device or decide to upgrade, you don't have to start over with the learning. Swiftkey can store this data in the cloud and sync it across multiple devices. SwiftKey saves typing time in multiple ways: Swype-like trace-to-type, shortcuts, long-press for alt characters and a dedicated number row on top if you want it. This is one of the most customizable keyboards I've used, with multiple color themes, the ability to change the size of keys and even the ability to split or push the keyboard to one edge or the other — great for phablet use. Price: Free on the Google Play Store. Of the seemingly million weather apps for Android (including the one that probably came with your phone, complete with animated widget), AccuWeather offers you one solid reason to ditch them and download it instead: MinuteCast. MinuteCast tells you the weather at this moment exactly where you're standing or in whatever zip code you enter — not the forecast for the whole city, the forecast for right where you are right now. MinuteCast is especially useful during storms. Want to know when it will start raining, when it will stop or when it will let up enough for you to dash home? This app will tell you. Android boasts some decent built-in security measures for keeping your data safe and finding a lost phone, but they don't address the other major mobile security threat: malware. TrustGo adds that protection plus advanced security features such as capturing images of a person trying to crack your security code, sounding an alarm to help you find a misplaced device and wiping the device remotely. Of all the free security apps available, TrustGo provides the most features for free. 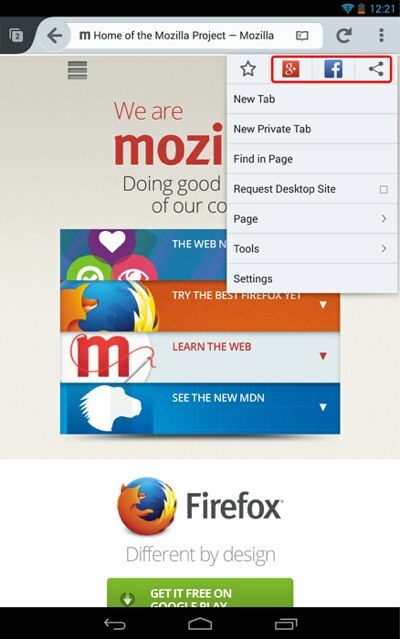 Firefox is our top web browser pick for your personal computer as well as your mobile devices. Google Chrome is great and comes preloaded on Android devices, but thanks to its large library of add-ons, Firefox is worth an extra step to download and install. Chrome doesn't support extensions on Android, but Firefox users can add Adblock, a cookie cleaner, flash video downloaders and hundreds more tools. Beyond that, Firefox Mobile is fast, clean and attractive, with an interface that syncs bookmarks, passwords and other data between all your browsers for seamless desktop-to-mobile use. Google Maps is turning into a decent restaurant and business suggestion app, but Yelp still has Google beat in terms of sheer data. Yelp's millions of user reviews are only one reason I use this app almost every day. New businesses show up on Yelp faster, and drilling down searches to a specific area brings up more results with a ton of reviews. Plus, I love Yelp Monocle, an augmented reality feature that shows ratings and business names on top of a real-time view from your camera. As soon as I got a smartphone, I ditched my alarm clock. The feature I missed most after making the switch was waking up to my favorite radio station. That's one of the reasons I like TuneIn Radio. TuneIn Radio can access any station with an online stream, and you can choose to wake up to that station via the app's alarm. While you listen, TuneIn brings up information about the song and artist or the program, which you can save. You can also use TuneIn to search beyond traditional radio for podcasts. 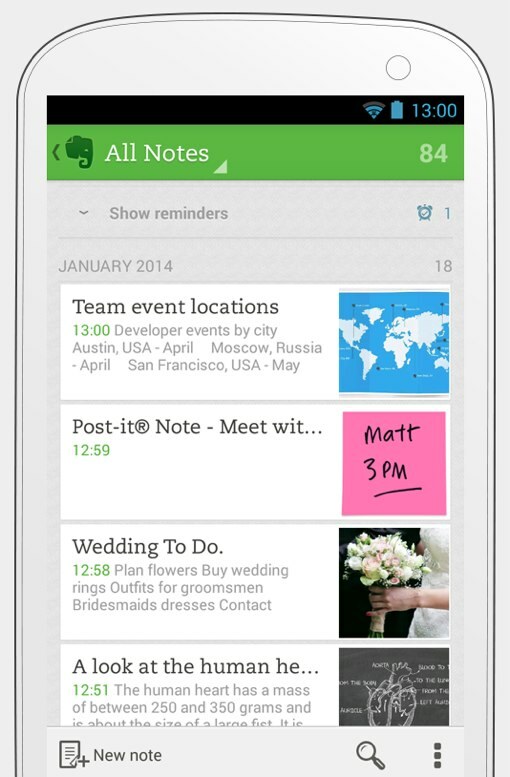 Most note-taking apps work fine for jotting down quick ideas and shopping lists, but Evernote offers so much more. Even if you think you need something simple, you'd be surprised how a more comprehensive app can change your daily habits. I'm a fan of receiving reminders about my notes, so I know to follow up. When I can't write or type fast enough, audio notes save the day. The best feature is the page camera. Take a snapshot of printed or handwritten pages, and Evernote scans them for words that it then indexes to show up in searches. Flipping through news using Flipboard, Blinkfeed, an RSS reader or Pulse is fine when most of the articles and posts are short enough to read in a minute or less. But for long reads, you want an app that strips away distractions (like ads) to offer an ebook-like reading experience that lets you immerse yourself in the words. That's why I love Pocket. Saving articles from your browser is easy, and Pocket automatically syncs all your stored articles for offline reading. Read them when you're ready, even if you're on a plane or a subway car. The reading experience is great, giving you control over the text's font, size and background. Downloading a document from email for reading or editing can be a pain if the office suite you're using messes with the formatting, isn't designed as well for small screens as for large ones or can't save in the most popular file formats. Most preloaded office suites are a pain, so I always replace them with Kingsoft. On top of Kingsoft's qualities as a good document editor, it connects to cloud services like Dropbox and Google Drive to allow you to edit and sync without opening another app. It can save to Microsoft Word, Excel and PowerPoint formats as well as in PDF format. DuoLingo can help prepare you for basic conversation in just a few months via fun exercises you do occasionally. You don't have to deal with the commitment of a class or spend hundreds of dollars right from the start. Not a super tech person, so really appreciate all of your info. Top 10 apps for android has been a life saver. I downloaded Trustgo immediately. Thanks Gene! Hope you enjoy them! Thanks for helping me just figure out what I want on my phone that fits my needs. I just wish I could remove all the other stuff I don’t need without voiding my warranty. Glad you found the story to be helpful! What are you looking to remove? I would recommended go with mesh it up app. The ultimate, quick file transfer application that will simplify your life. No use of your data plan, faster than Bluetooth, no cables, and you don’t need cell phone service! No extra costs as Mesh It Up doesnt need data usage. Transfer between all platforms at lightning speed with the best file transfer tool. Check out below following link. You should’ve read the ‘Permissions.’ That goes for all of you tech-geeks in cyberspace. No app developer gets access to my contacts save the app helping me to manage them, not to mention my 4 ext. HDs. That’s the main reason I’ll NEVER have FB, etc., account. FB is selling your info to marketers, disregards copyright (I am a published author & singer/songwriter) & supports causes I vehemently oppose. There you have it. Caveat emptor - free ain’t always free. How to remove apps that we replace? Suzanne, thank for this very useful info. You have tapped into an audience of millions of us who are older but not dead yet. Could you please address the #1 question we have after we download apps that you suggest? This question is: How to get rid of similar apps that probably came with our smart phone. Some won’t go away, it seems. Thanks for your answer. Glad you’re finding our stories helpful (and that you’re not dead yet )! The inability to delete apps that come preinstalled on your phone, especially the generally useless ones added by your carrier (known as bloatware), has long rankled tech reviewers and consumers, alike. Because this bloatware is part of the phone’s firmware, the apps are often impossible to delete without rooting your device (not a path I would recommend for the average user). However, you can at least try to delete them through Settings, Apps, clicking on the app you want to delete and then hitting Uninstall (path may be slightly different depending on your Android version). If that method doesn’t work, the app probably can’t be deleted. You can at least hide all these crap apps by creating a folder called Zcrap (I have a z in front so it appears at the end of my list) and moving all of your bloatware into it. If you’re in the market for a new phone, many devices now come in “unlocked” versions without all the carrier crap added. But be prepared to pay full price up front. It has been awhile but wanted to thank you for the info you provided in answer to my question. Very helpful! First off, thanks for the tip re: Swiftk’board. I am 6’4”, big ‘paws’, even though I play guitar , only one good eye. Just got the S4 16 GB & the small k’board drives me nuts! Further, I’ve just read the user comments on TrustGo page on G-play (you should too! ); 3 biggest complaints: login, private data taken & NO tech-support! No info on ‘Permissions.’ Too many red-flags. Thanks but no thanks. Next, I’m getting Mozilla; been using it on my PCs for 15-20 y - hate IE, haven’t touched it for that long. Chrome is plain boring. Thanks for that info. So, two ++, one big minus. I recommend Kaspersky - they cracked the nasty Cryptolog bug! Keep up the good woik, ladies. When we wrote this article about a year ago, TrustGo was a solid app. It appears they haven’t updated the app in quite some time, and the information on their website is quite dated, leading us to believe (in addition to the user comments you pointed out) that this may have become a zombie app. Obviously, the last thing you want is a security app that isn’t being kept up to date. Kaspersky, unfortunately, is not a free app and our experiences with it during our spyware testing were not strong (note that these test go back a couple of years, so things could have changed). For solid free mobile security, we would suggest taking a look at Lookout Security. And yes, Swiftkey is awesome!